Random Handprints - A NYC Mom Blog... live from New Jersey: I love the clothes at Tea Collection. And yes, I have the video to prove it. I love the clothes at Tea Collection. And yes, I have the video to prove it. I love the clothes at Tea Collection, so I was overjoyed when they asked if I would like to review some from their summer collection. 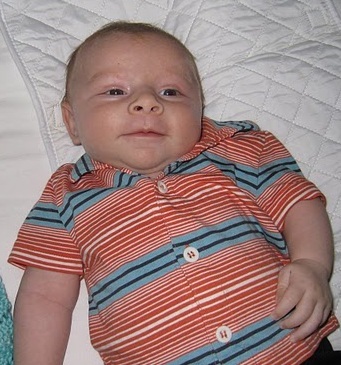 My little guy Ziggy has been wearing their baby clothes since he was a newborn. I went online to shop for both something for my son and my daughter, eventually choosing cute matching outfits from the Costa Brava Collection (a plaid hoodie for my toddler boy which is now on sale for $29.50, and a plaid romper for my five-year-old girl, also on sale for $39.50). For those of you not familiar with Tea, they make incredibly durable and stylish clothes for boys and girls (with no licensed characters in sight!) for newborns through age 12. Tea also has some great clothing for women, too. And because my new addiction is Animoto, I made a video of my kids wearing their new summer outfits. Watching this, you won't need me to tell you that while these clothes may look good, they are clearly made for play. And... I'm a Tea Collection affiliate, too. Just so you know. Those are really cute, both of them. No wonder you're a big fan. Very, very cute. Makes me want to have another. Oh my god, what am I saying. Very cute - I love Animoto. I just take a peek and I discovered your blog. It is worth discovering. Big thanks for sharing.